■ The official Hello! Project site added the covers for ℃-ute’s next single and single v, “Kimi wa Jitensha Watashi wa Densha de Kitaku”, to their discography pages. (Single, Single V). Each girl will be featured on the cover of their respective limited edition, and the single v features an official English translation of the song’s title, “You Ride Your Bicycle While I Catch the Train Home”. The single will be released on 4/18, and the single v on 4/25. 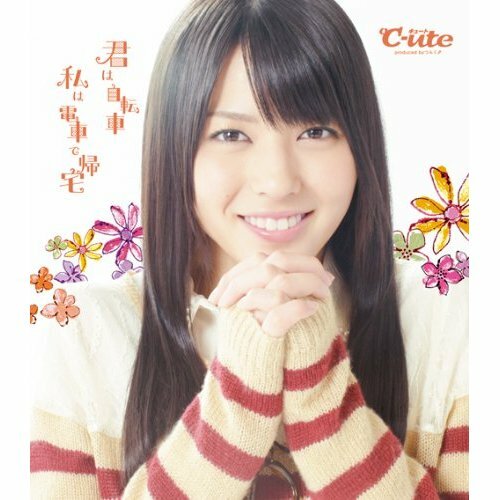 Update: Amazon.co.jp has larger versions of each individual cover now, and the cover for Maimi’s version (Limited B) is pictured below. Posted on March 27, 2012, in News and tagged ℃-ute, C-ute, Hagiwara Mai, Nakajima Saki, Okai Chisato, Suzuki Airi, Yajima Maimi. Bookmark the permalink. Leave a comment.